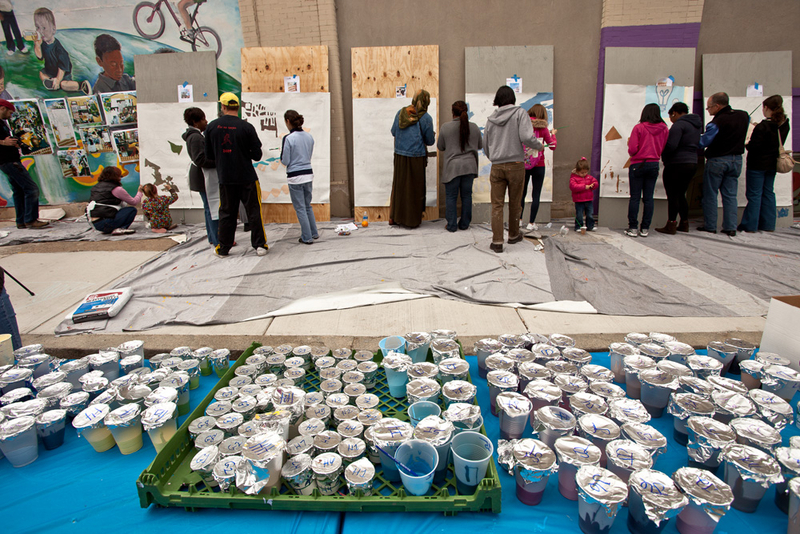 Tucked into a backstage corner at this past weekend’s Roots Picnic was a paint station set up by the City of Philadelphia Mural Arts Program. Throughout the weekend, performers, press, and attendees stopped by to paint tiny sections of a future mural in honor of the Roots. Most participants and passers-by were surprised to learn that the 5×5 sheet of Polytab “parachute cloth” fabric would be combined with dozens of other similar sheets and installed like wallpaper on its permanent home. 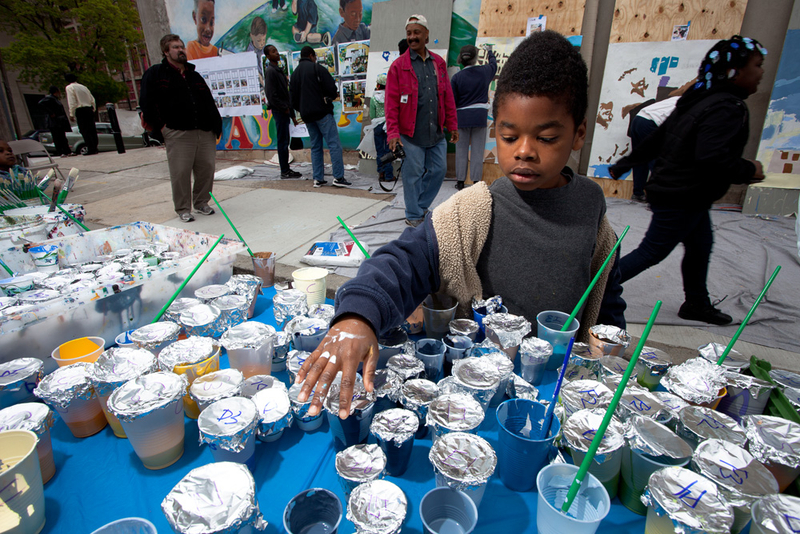 As a photographer for Mural Arts, I’ve been to dozens of these paint days. 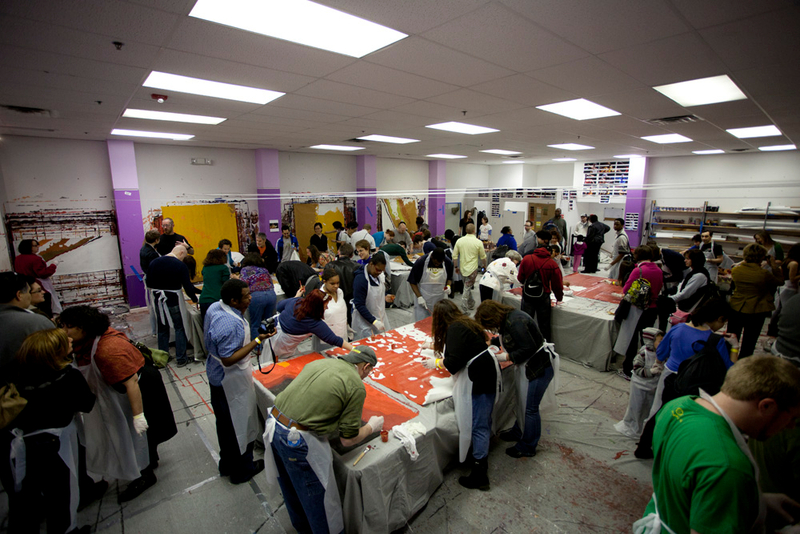 As one of the most visible and well-publicized Philadelphia area nonprofits, I’m always surprised at how little those outside the organization know about what goes into creating a mural. What you see on the wall represents the final result of a much longer process and community paint days are an important part of that process. 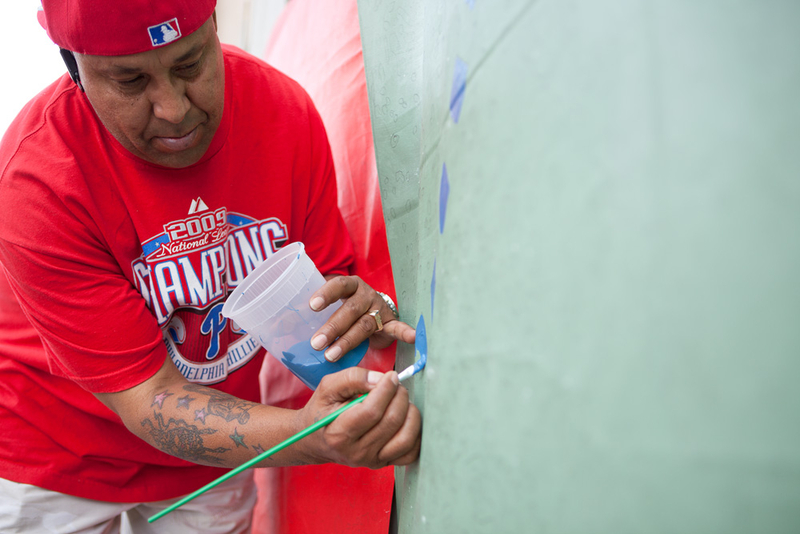 When the in-progress mural in honor of the Phillies is unveiled at 24th and Walnut, more than 1,000 people will have had a hand in creating it. Painting on parachute cloth is what makes this collaboration possible. It would have been logistically, practically, and legally impossible to put fans, players, and their kids on 8 stories of scaffolding at a wall abutting an active rail line. 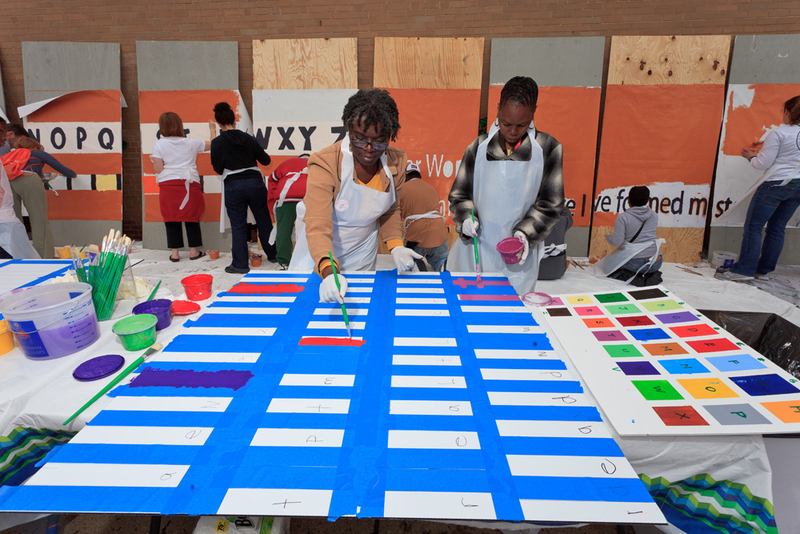 Instead, Mural Arts brought parachute cloth panels to Citizens Bank Park for a series of paint days. Lead artist David McShane also brought sections of the mural to Clearwater, Florida during spring training where current and former stars helped to paint. Kids and baseball players aren’t typically trained artists, but the scale of a mural project makes participation relatively foolproof. 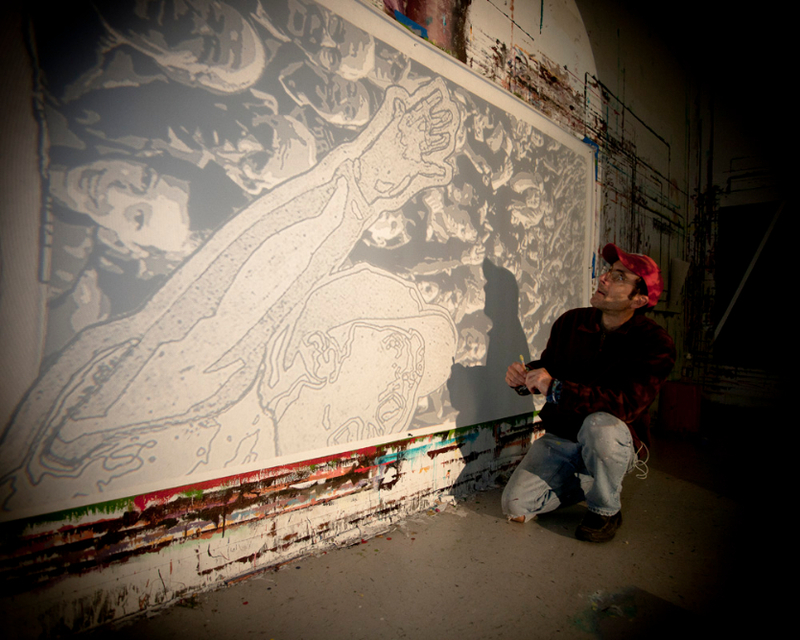 Before painting, colors are blended and contrast outlines drawn in a paint-by-numbers pattern. Blending and touch-ups are done by a lead artist and their assistant(s) back in a studio. 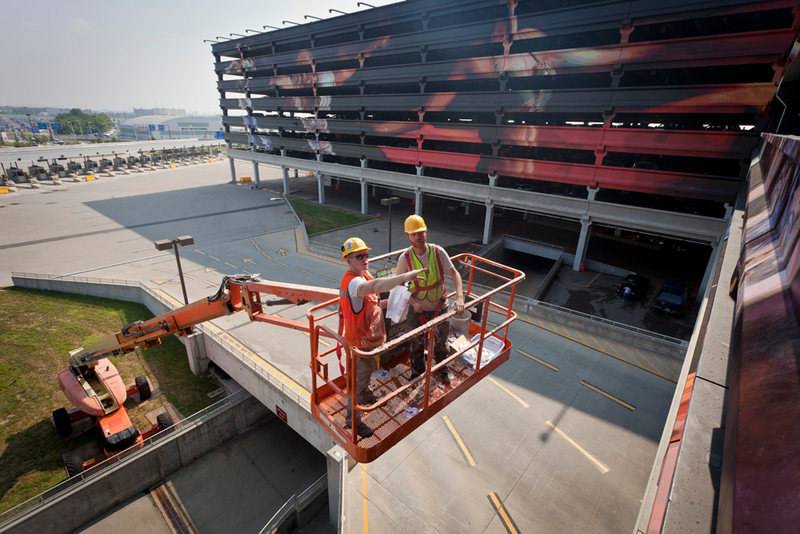 Limiting scaffolding and lift rental costs to a few weeks of installation, helps reduce overall project costs and streamlines logistics. 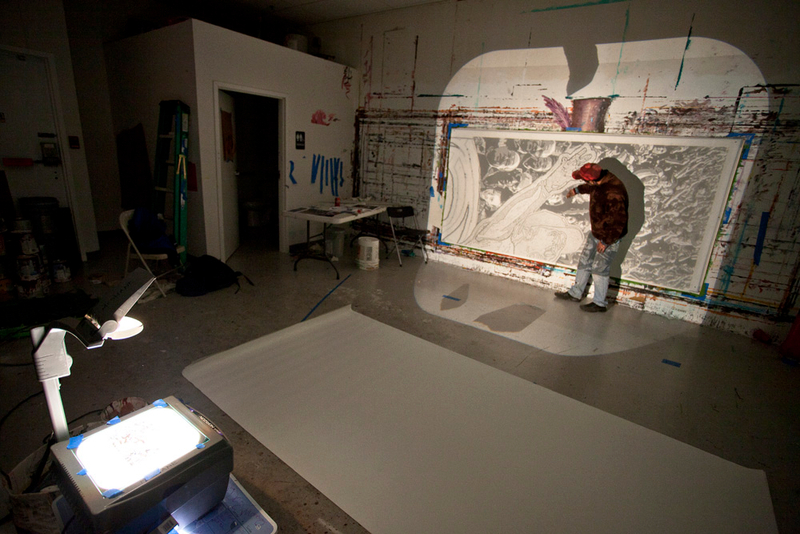 In a studio, paint and supplies don’t need to be shuttled back and forth throughout the implementation of a project. 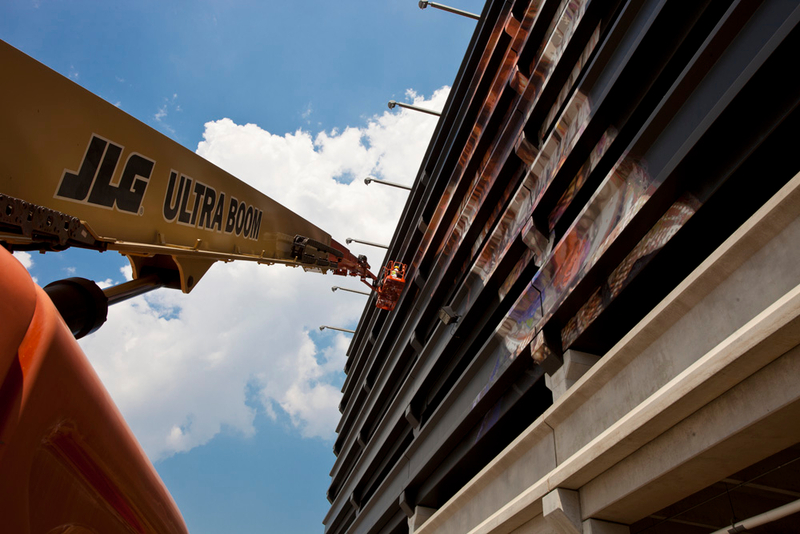 Working indoors also makes it possible to work in all weather and all seasons. 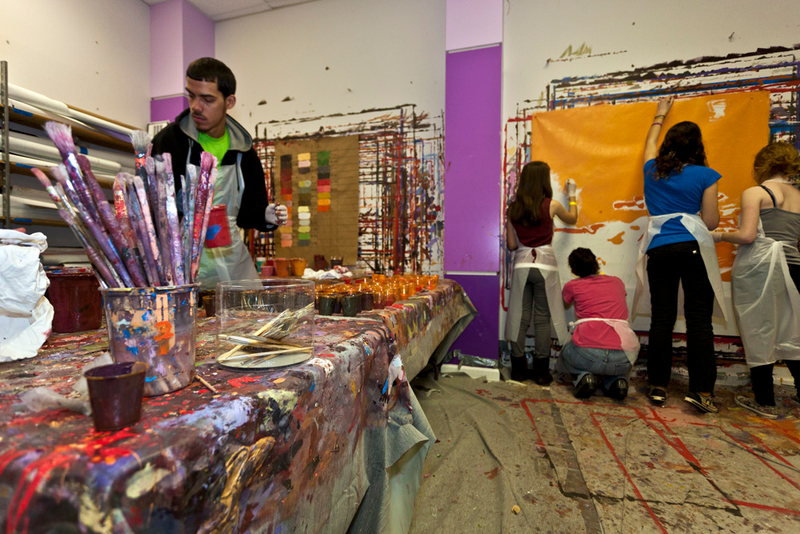 Since 2010, the Pennsylvania Real Estate Investment Trust (PREIT) has offered Mural Arts free and reduced cost studio space in the Gallery Mall in center city. The 85,000 square foot “How Philly Moves” mural was painted in 2 vacant storefronts on the 3rd level of the mall. Enormous panels were laid out across the floor of an abandoned clothing store to check for incongruities before installation. When a 5×5 panel represents a fingertip, getting it right can be tricky. Most simply, the parachute cloth method expands participation. Murals panels can be flown around the world, brought inside prisons and worked on in any weather. The method is indispensable for an organization looking for ways to increase opportunities for collaboration. Earlier this year, I was photographing a mural in Mantua when a little girl about 9 years old walked up and proudly pointed to a spot on the wall about 20 feet off the street. She smiled and said, “I painted that.” There’s a sense of ownership over the final mural that even a small contribution creates. It reminds me of riding around town with a construction worker as they point out buildings that they’ve worked on. 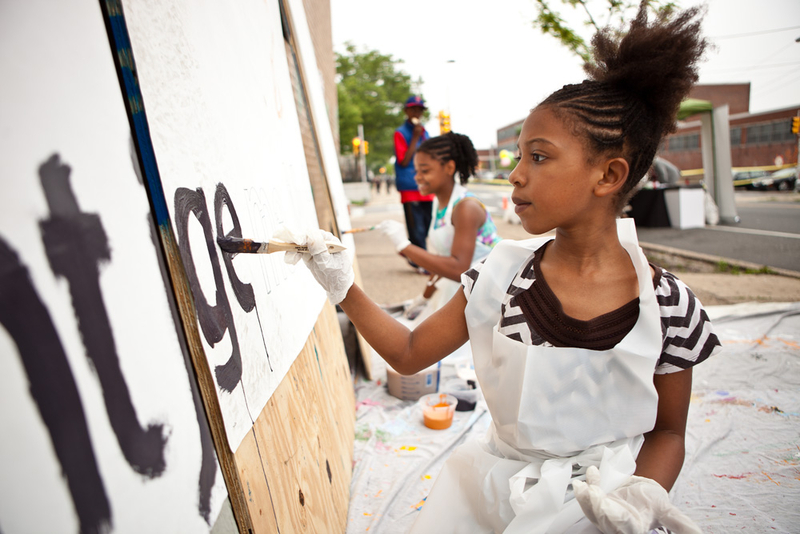 Bringing the creation process to anyone who wants to participate is a small, but meaningful net positive for Philadelphia.